Finance Ministry to deduct from tax funds collected on behalf of PA amount equal to salaries PA pays to murderers and terrorists. The cabinet is expected to approve a significant cut in the amount of tax revenues that Israel will turn over to the Palestinian Authority in the coming two weeks, in response to the PA's continued payments to terrorists, Yisrael Hayom reported. 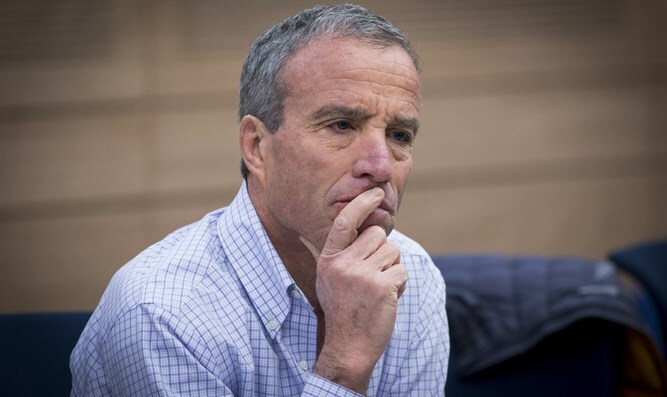 According to the report, the offset will be made in accordance with a law passed by MKs Elazar Stern (Yesh Atid) and Avi Dichter (Likud) last summer, which requires the Defense Ministry to present to the cabinet data on the scope of terror salaries and the finance minister to reduce by that amount the tax revenues that Israel collects for the PA.
MK Stern, one of the initiators of the law, welcomed its implementation. "I have no doubt that the law will reduce terror and harm Israelis, who would otherwise have joined the cycle of painful bereavement. The main questions I have come across since the passing of the law are how no one has thought of it before, and how have we come to terms with this hallucinatory reality for so many years? "